Just like home, spacious front living room. 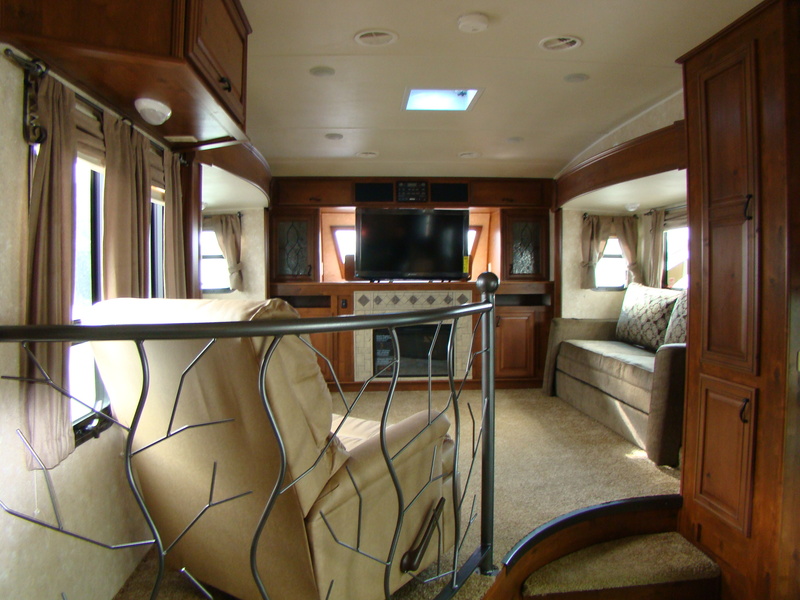 The Open Range 386 FLR is the newest entry in the front living room fifth wheel RV line up. This floor plan is every customers “dream come true”! Loaded with every feature and benefit you have come to expect from Open Range. From the spacious dual slide-out front living room with opposing air bed sleeper sofas and wall hugging recliner, to the step up rear king master bedroom. 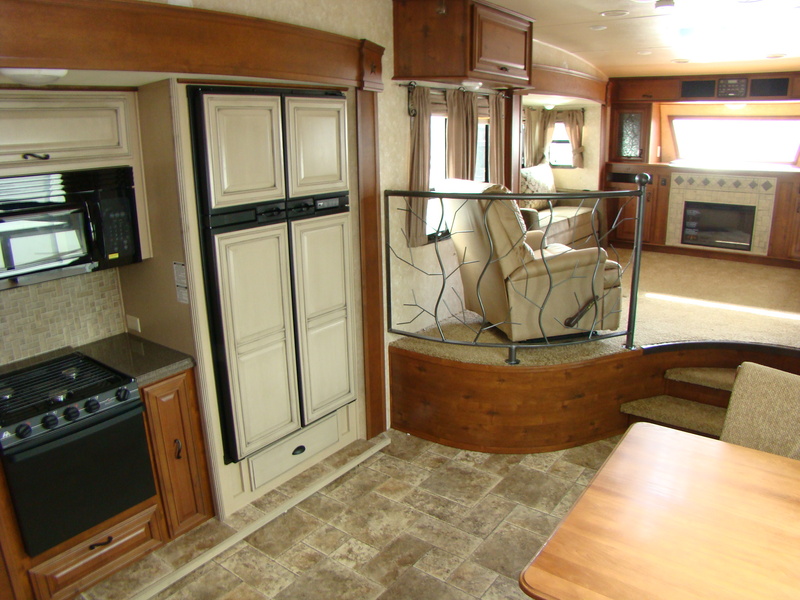 What helps to set the Open Range 386 FLR apart from all the other front living room fifth wheels on the market is the storage area under the rear bedroom. 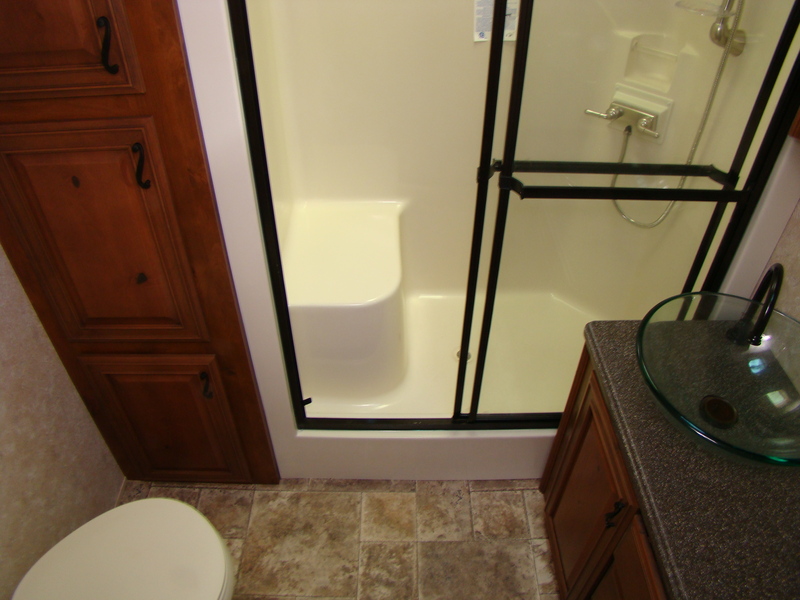 This storage space provides you with an additional 170 cubic feet of exterior storage, on top of the standard front basement storage that is normally found on every Open Range RV. The spacious living room features plenty of storage options, an electric fireplace, as well as a 42″ LED TV on an electric lift. Once the TV is lowered into the storage position, the window in the front cap is exposed to provide you with the natural light that other front living room 5th wheels limit. The living room includes an area for a comfortable wall hugging recliner. The iron work railing helps to add a decorative touch to the openness of the living room. The front window allows natural light to filter in. 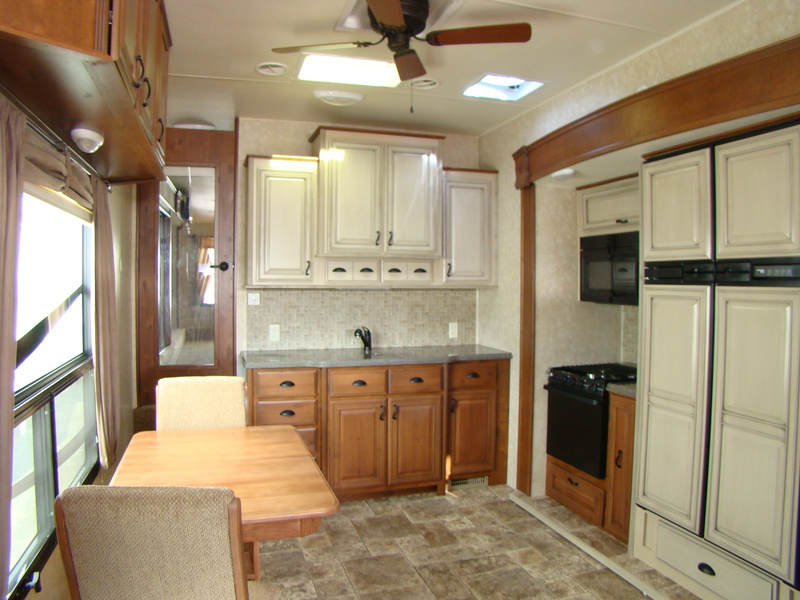 The kitchen is centrally located in the trailer and is as wide open as the living room. Solid Alderwood storage cabinets and Corian counter-tops await and beckon your use.. A large side by side, 12 cubic foot gas/electric Norcold refrigerator is waiting to be filled. The free-standing dinette table expands to accommodate seat six people. 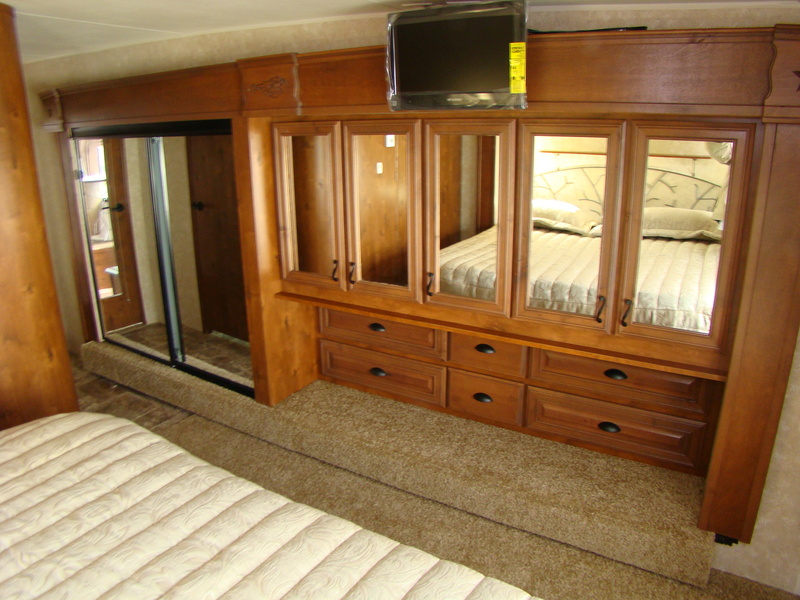 The step up rear king bedroom provides you with even more interior storage. Once you enter the bedroom you will first notice the dual sliding glass door wardrobe, six storage dresser drawers, and even more additional wardrobe storage. You have full storage under the king bed as well. With full TV/cable/satellite hook ups located above the wardrobe slide. The bathroom will not disappoint you either. From the large shower with sliding glass doors, a large linen closet and vanity with vessel style sink. The vanity provides you with ample counter top space and even more storage. This exciting new fifth wheel is a new breed apart. 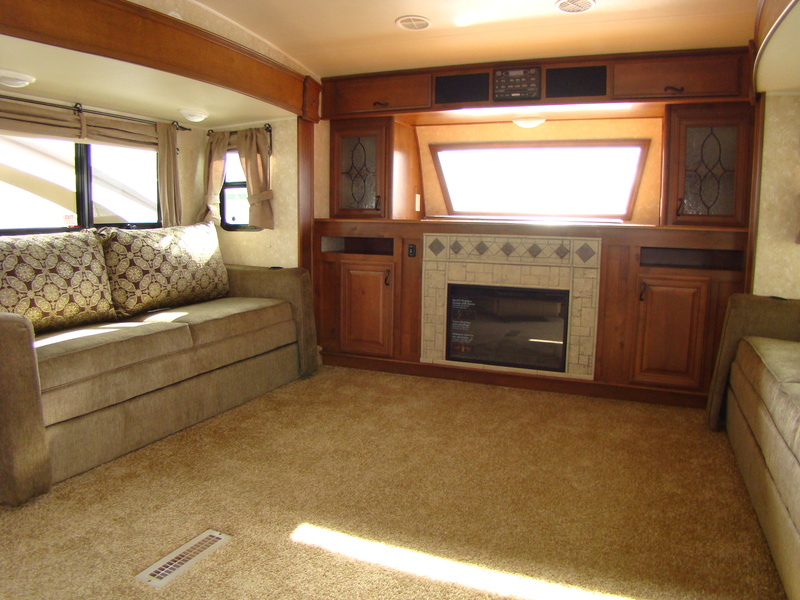 This front living room fifth wheel is a true four season unit, complete with R38 floor and R38 roof insulation. An automatic leveling and stabilizing system allows for easy setup. Four 20lb LP tanks provide you with 80lbs of propane over the industry standard 60lbs. 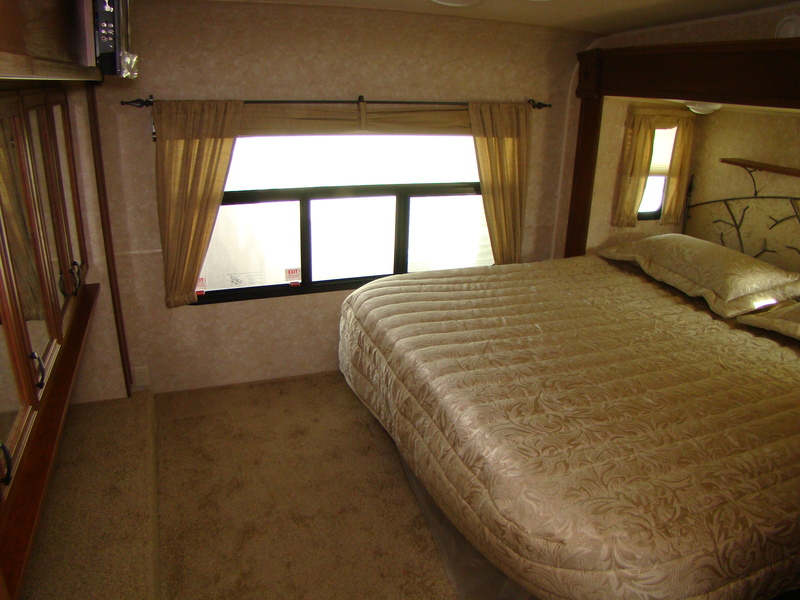 All of this is standard on an Open Range RV. Take a step into an all new Open Range 386 FLR to experience the new standard in front living room fifth wheels. Be sure to visit Pennsylvania’s largest Open Range RV Dealership, Lerch RV.